As a Developer Advocate for Pivotal, I present at conferences about leading-edge software development technologies such as Spring, Cloud Foundry, and machine learning. Lately, I’ve also been presenting about quantum computing, and have developed an open source application that utilizes quantum computers to compose and perform music. The name of the application is Quantum Music Composer, and it works with Rigetti and IBM quantum simulators and computers. The style of music that it helps compose and perform is a very simplified version of 17th century counterpoint. The image at the top of this article, for example, is a music score captured from an improvisational composition by the Rigetti 8-qubit Agave quantum computer. Quantum Music Composer ibmq-ten-third from James L. Weaver on Vimeo. I would love your feedback on the application after you’ve tried it out, and please let me know if you have any questions about its implementation. This entry was posted in Counterpoint, Quantum computing on June 21, 2018 by javafxpert. As a musician and software developer, I look for synergies between these two roles. One such example is the app that I’m developing for the purpose of helping musicians with ear training. This app, named Music Ear Trainer, contains a voice user interface (VUI) that trains the user’s ear to recognize musical constructs such as intervals and triads. If you have access to a Google Home device, you may invoke the app by saying “Hey Google, talk to Music Ear Trainer.” The app will invite you into a conversation, playing intervals and triads for you to verbally identify. The Music Ear Trainer app uses Actions on Google to implement its Google Assistant functionality. I chose to use the API.AI tool to build my Assistant actions. The following diagram contains a portion of the conversation flow design, consisting of constructs including contexts, intents, text responses, and webhooks. The Music Ear Trainer app is licensed under Apache License Version 2.0, and is available in the ripped-ear-vui GitHub repository. Please let me know if there is functionality you’d want to add to Music Ear Trainer, or if you have any questions about its implementation. This entry was posted in Ear training, Intervals, Triads on February 9, 2017 by javafxpert. Here’s the abstract for the presentation: Leveraging the power of Cloud Services, this session demonstrates how music can be analyzed and composed in real-time to augment musical performance with a futuristic instrument. This session contains an introduction to relevant cloud services, and an introduction to music theory and composition. This session also has musical demonstrations and code snippets scattered throughout. This entry was posted in Counterpoint, LinnStrument, Software development on December 4, 2015 by javafxpert. It is hard to write a beautiful song. It is harder to write several individually beautiful songs that, when sung simultaneously, sound as a more beautiful polyphonic whole. The internal structures that create each of the voices separately must contribute to the emergent structure of the polyphony, which in turn must reinforce and comment on the structures of the individual voices. The way that is accomplished in detail is…’counterpoint’. 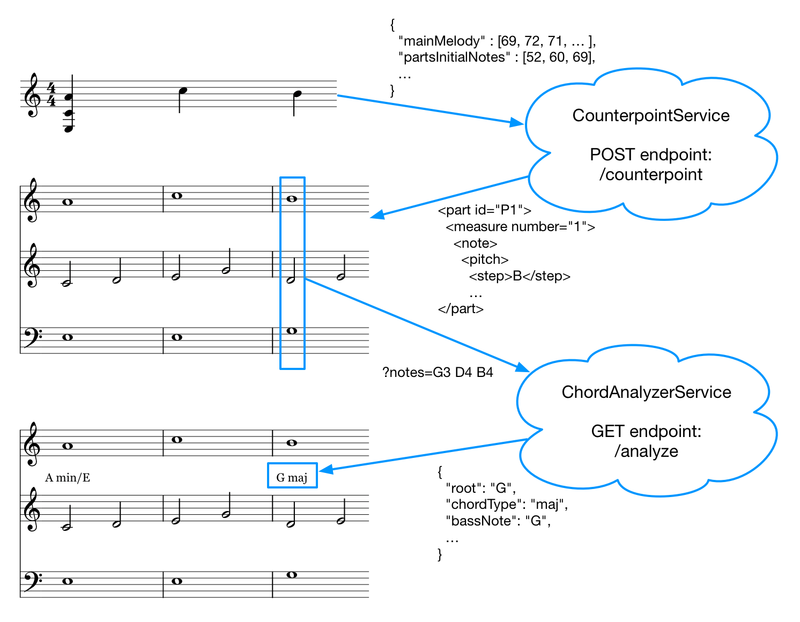 CounterpointService: Given a JSON representation of the main melody, initial chord, counterpoint species, and music mode, this service returns a MusicXML representation of the resultant counterpoint composition. 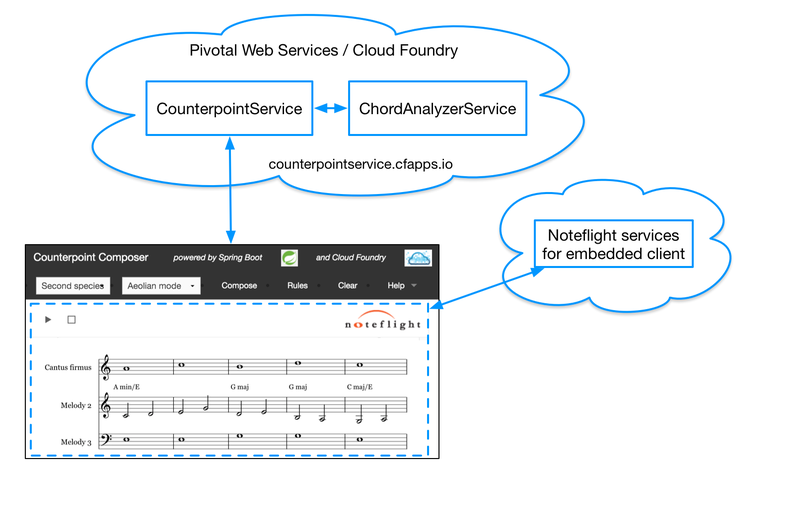 ChordAnalyzerService: This service analyzes a set of musical notes to see if they represent a musical chord, returning the name of an identified chord. In addition, the Help -> Technical Presentation menu item contains slides that give a technical perspective of the application. Please note that it is best to use the Chrome browser, as that is currently (Nov 2015) the only one that supports the Web MIDI API. I’m sure that you recognize the innovative instrument in the diagram above is a LinnStrument (the current focus of this blog) but any conventional MIDI keyboard controller should work as well. It is my hope that this Counterpoint Composer application will serve as a resource for music students, as well as software developers, of all ages! 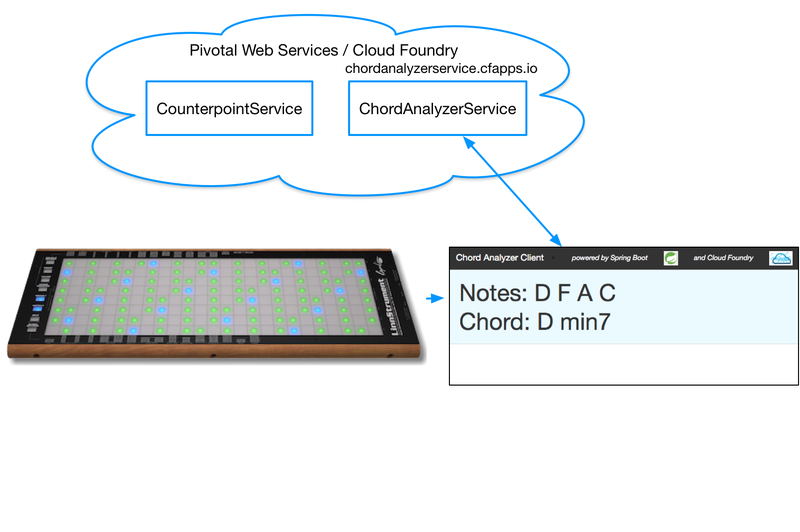 This entry was posted in Chords, Counterpoint, LinnStrument, Software development on November 12, 2015 by javafxpert. In Part I of this series, I introduced the topic of Getting “Real” on LinnStrument. In Part II, let’s explore playing a modeled saxophone on LinnStrument. As most keyboard / synthesizer / sampler players know, saxophone presets on keyboard instruments leave much to be desired. Often, the basic sound is fairly accurate, but any attempt to move the pitch or tonality around like a saxophone player gives away the fact the listener is hearing a poor imitation of a saxophone. Antoine-Joseph “Adolphe” Sax (inventor of several instruments including the saxophone) probably would have desired higher audio fidelity of his brainchild by electronic instruments 170 years later. Fortunately, the synergistic effect of some recent innovations have enabled dramatic improvements. Roger Linn’s LinnStrument website has a handy page summarizing Recommended Sound Generators. Sample Modeling instruments are listed under Single-Channel MIDI Sound Generators With Special Advantages for LinnStrument. With respect to Sample Modeling instruments like “The Saxes,” this is a bit of an understatement. While missing certain features (like Y-axis control), these instruments have leapt ahead in realism, especially when combined with LinnStrument. 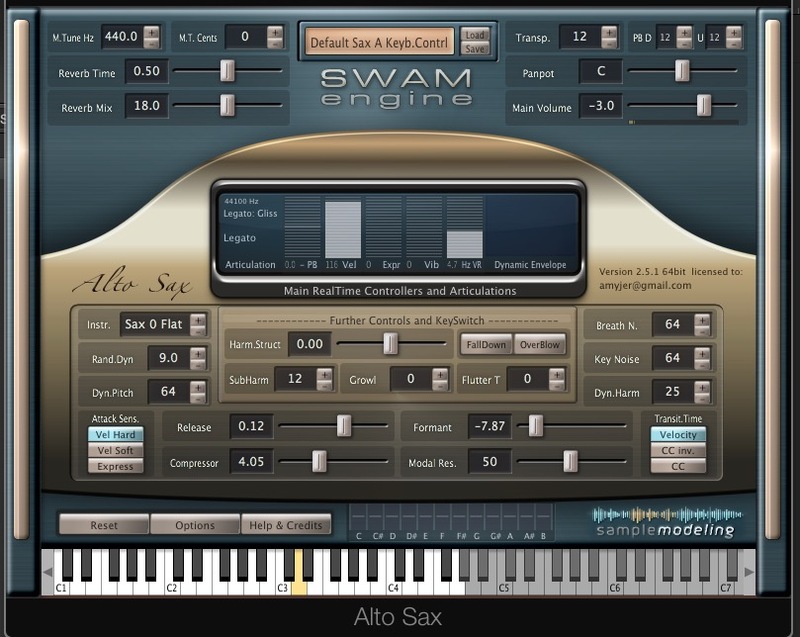 Sample Modeling “The Saxes” use their own SWAM (Synchronous Wavelength Acoustic Modeling) engine. While the SWAM engine has preferred features for use with LinnStrument (e.g., Y-axis control), it can only be used as a DAW (digital audio workstation) plug-in and is not a standalone instrument. 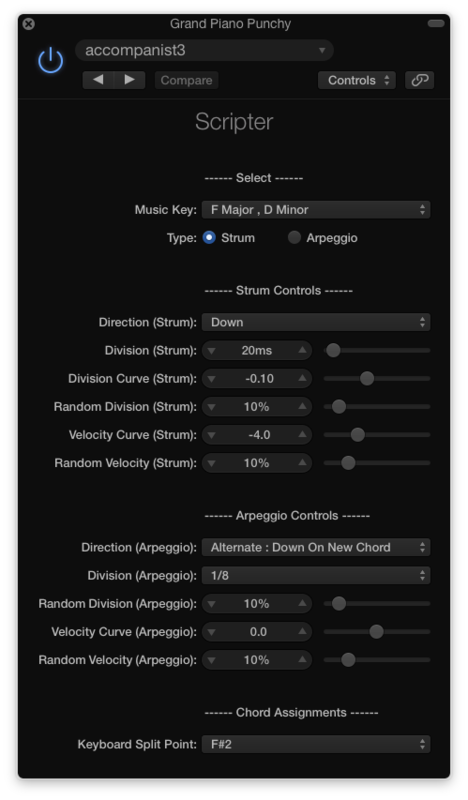 For convenience, I saved presets for each saxophone in Logic Pro to avoid the process of entering the various parameters each time I use an instrument. Your DAW may also have the ability to save instrument presets. Although designed to be played on a standard piano keyboard or with a wind controller, the Sample Modeling instruments are ideally suited for LinnStrument because you can access multiple articulations without lifting your finger off the playing surface. For realistic playing, this feature is key. Unlike playing a note on a piano, playing a saxophone note is a complex combination of mouth and breath control and pressing the appropriate key combinations on the instrument. Not only does the sax player need to play a particular note at a particular time, she also needs to move from one note to another musically using articulations such as slide, slur, and staccato. Realism in imitating a saxophone is more about what happens between the notes using these articulations. Thinking like a saxophone player requires not only thinking about the notes you want to play and their duration, but how to get from one note to another. Do you want to play staccato or legato? Slur the notes? Ascend chromatically? On top of these decisions, you need to be aware of the dynamics which can be carefully controlled through breath control. Many advanced sample libraries provide these articulations through key switches (e.g., press a key to switch to a desired articulation). However, using key switching can be cumbersome and requires timing the key switching with one hand while playing with the other. What if you also want to bend the pitch? That requires another hand to move the wheel and yet another hand to change the modulation. The LinnStrument provides one surface to achieve all of these articulations. Reducing the pressure sensitivity was helpful for higher register playing. Breath control was the most difficult articulation to control for me because of how sensitive the virtual instrument is to changes in pressure. After selecting the appropriate pitch bend setting (+/- 12) (under Per-Split Settings -> Bend Range -> 3rd button down from the top row), I found sliding between notes to be very easy and natural as long as I maintain control over the pressure. Slight variations in pressure can cause unwanted squealing from the instrument. The instrument also has a very sophisticated slurring feature – if you hold down a first note and press a second note while still holding the first note, the note values will slide up chromatically in a very realistic way. However, if you do not want the “chromatic slide” you have to be sure to lift your finger off of the first note before you play the second (Note: These are all monophonic instruments). At this point, I was still having difficulty fully controlling the pressure sensitivity. This improved over time, and I began to appreciate the dynamic range that you can achieve by combining the pressure sensitivity of LinnStrument with the breath control sensitivity of the Sample Modeling’s Saxophone instruments. I suggest adjusting the pressure control on the LinnStrument to find a comfortable setting for your playing. Below is a video example in a trio context (bass, drums, soprano saxophone). Here, I am using a lighter touch which helps with control of the dynamics and pitch slides. First, you will need to take the time to install the instrument and make the technical adjustments in the plug-in itself and the LinnStrument. The links above should help you with this task. It is very important to adjust the pitch bend setting to +/- 12 on the LinnStrument to take advantage of the full range (12 semitones) of the instrument for sliding. Second, take the time to get used to the breath control/pressure sensitivity and make adjustments on the LinnStrument. There are three settings for High, Medium, and Low along the bottom row in the settings panel. Third, practice articulating between notes – staccato, sliding your finger into the next note, and the slurring feature (holding down the first note and holding down a second note for the chromatic slur). Jeremy Cubert is a solo artist and member of the jazz fusion band Apothecary (www.apothecaryband.com) and international progressive rock band Formativ (www.soundcloud.com/formativ). He has recorded with Jon Anderson and Billy Sherwood of Yes and the bands Quest, Zapotec, History of Ties, and the Archaic Revival. 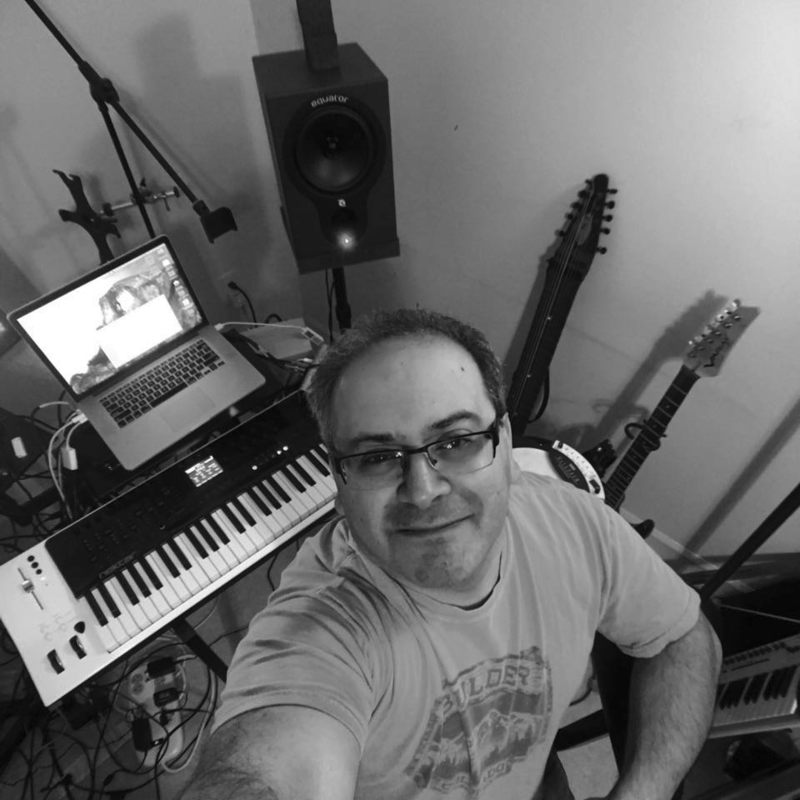 While primarily a piano and keyboard player, Jeremy has studied and played instruments including the Chapman Stick, LinnStrument, Zendrum, Eigenharp, guitar, Godin MultiOud, and trumpet. All screen shots used in this blog post are used with permission from Roger Linn Design. The saxophone image is a Public Domain image via Wikimedia Commons. This entry was posted in Imitating real instruments, LinnStrument and tagged Getting Real, LinnStrument on July 29, 2015 by javafxpert. In the Domo Arigato Tempo Rubato article we discussed that each note pad on the LinnStrument playing surface has three dimensions of musical expression: Moving your finger along the X-axis varies pitch, moving it on the Y-axis influences timbre, and varying its pressure on the Z-axis controls loudness. Given that each note pad has three dimensions of control, and each dimension has a resolution of 128 values, there is much expressiveness to be explored in each note being played. Because LinnStrument is a polyphonic instrument, you can play several notes simultaneously which further increases the potential for expressiveness. The trade-off is that the more fingers you’re simultaneously employing, the less focused you can be on the expressiveness of a given note. The following tables in this quick reference includes information gleaned from the Apple Logic Pro Effects manual, example scripts such as Guitar Strummer included with Logic Pro, and the following file from the Logic Pro X installation on my Mac. HandleMIDI(Event) This function is called each time a MIDI event is received by the plug-in, and is required to process incoming MIDI events. If you do not implement this function, events pass through the plug-in unaffected. ProcessMIDI() This function is called once per “process block,” which is determined by the host’s audio settings (sample rate and buffer size). This function is often used in combination with the TimingInfo object to make use of timing information from the host application. To enable the GetTimingInfo feature, add NeedsTimingInfo = true at the global script level. ParameterChanged(integer, real) This function is called each time one of the plug-in’s parameters is set to a new value. It is also called once for each parameter when you load a plug-in setting. GetTimingInfo():TimingInfo Retrieves a TimingInfo object, which contains timing information that describes the state of the host transport and the current musical tempo and meter. GetParameter(string):real Returns a given parameter’s current value. GetParameter() is typically called inside the HandleMIDI() or ProcessMIDI() functions. sendAfterBeats(beats:real) Similar to sendAtBeat(), but uses the beat value as a delay in beats from the current position. toString() Returns a String representation of the Note event. velocity(integer) Velocity from 0–127. A velocity value of 0 is interpreted as a note off event, not a note on. toString() Returns a String representation of the PolyPressure event. number(integer) Controller number from 0–127. value(integer) Controller value from 0–127. toString() Returns a String representation of the ControlChange event. toString() Returns a String representation of the ProgramChange event. toString() Returns a String representation of the ChannelPressure event. value(integer) 14-bit pitch bend value from -8192–8191. A value of 0 is center. toString() Returns a String representation of the PitchBend event. toString() Returns a String representation of the Fader event. blockLength:real Indicates the length of the process block in beats. tempo:real Indicates the host tempo. meterDemoninator:integer Indicates the host meter denominator. MIDI – Contains class-level variables and functions (you don’t instantiate MIDI). noteNumber(string) Returns the MIDI note number for a given note name. For example: C3 or B#2. Flats not permitted. noteName(real) Returns the name for a given MIDI note number. Allow chord mode selection via a switch on LinnStrument (or pedal) that maps to a control change message. Primary modes currently consist of vanilla (major/minor/dim) vs. jazzy (maj7/min7/dom7/half dim7) chords. When a single note below the split point is pressed, that note is output. In addition, a chord is output whose root is that note and appropriate to the chosen key signature. The chord is voiced (inversion, etc.) in a manner that assures minimal movement from the previous chord. When two notes in the same octave below the split point are pressed, the higher note is the root of the chord output, and the lower note is output as well. This technique facilitates playing so-called slash chords. When two notes an octave apart below the split point are pressed, the tonality toggles in most cases from major to minor and minor to major. As a demonstration of the features outlined above, here’s a one-minute video of the first few measures of Feels So Good by Chuck Mangione. The LinnStrument is split, with a grand piano synth on the left and a trumpet synth on the right. Imitating “real” instruments has been the holy grail of synthesis and sampling for decades. 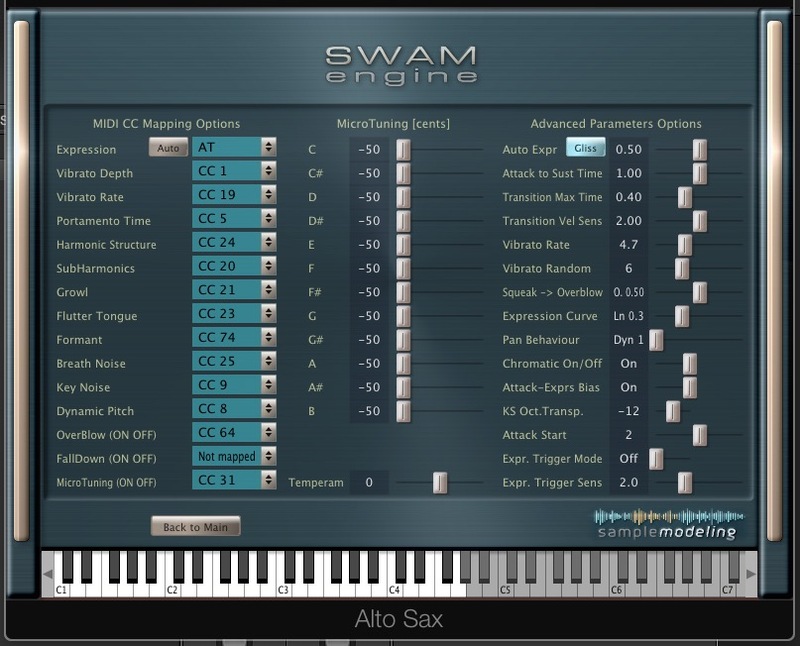 The plethora of keyboard presets with names like guitar, violin, piano, sax, flute etc. hinted at the desire of many players to access these instruments through synthesis. expressiveness on standard controllers were limited. Improvements in computer, sampling, and modeling technology have largely addressed the first problem – the sounds are indeed very, very close. However, the second problem persists and is the Achilles heel of making convincing virtual recordings and performances. Enter the multi-dimensional controller! With LinnStrument, Roli Seaboard, Haken Continuum, the Eigenharp and others, the musician can readily add natural sounding vibrato, pitch bends, and changes in timbre through micron level movements of fingers. So, the pieces of the puzzle may finally be in place. Now what? In this Getting Real series of articles, I am exploring the use of the LinnStrument with sound generators designed to imitate real instruments and how to approach playing them in a realistic way. Let’s consider LinnStrument as a controller, take a look at sound generators, and discuss techniques for achieving realistic performances. As a Chapman Stick player, I was immediately drawn to LinnStrument because the fourths tuning of LinnStrument’s “strings” is identical to the melody side of the Chapman Stick. The combination of pressure sensitivity and the ability to slide between notes make LinnStrument an excellent choice for exploring more nuanced expression. The first three on the list required a certain leap of faith because there were no demos available – either they would work well or I had made a fairly expensive mistake. AAS provided demos for me to try before buying. As a general rule, the products that utilize sampling technology require suitable disc space, a robust hard drive, and a good quality audio interface to get the best performance. The AAS products are modeled and require little disc space, however depending on what you are doing you may need to keep on eye on your CPU meter. In my case, I did not have any technical issues with performance using LinnStrument, my MacBook and these sound generators. Step One has both practical and abstract parts. On the practical side, understand the range of the instrument and what can be done with it. For example, some instruments are monophonic so do not play chords. For stringed instruments, it is not possible to play more than one note on a string (although possible to play the notes on different strings). Listen to players carefully to understand their phrasing, how they get from one note to the next, how they articulate notes, how they tune of the instrument, whether they play melodies or chords, and whether they play fast or slow. Some of the sound generators make this step very easy. For example, many of the sampled instruments only bother sampling notes that are in the range of the instrument. In addition, many include the ability to add articulations either by key switching or automatically (e.g., playing legato will result in a slur or hammer on). Modeled instruments tend to give the musician more options which can lead to very interesting and musical results, but not if you are attempting to imitate the real instrument. For some sound generators, I needed to adjust the velocity sensitivity on the LinnStrument to the lowest setting because the minimum amount of pressure resulted in maximum velocity and some undesirable results (squeaks, and unwanted vibrato). For other instruments, I adjusted the sensitivity on the sound generator instead. This is a trial and error process that will depend on your playing style. Importantly, the pitch bend will need to be adjusted for each instrument. For a violin, being able to slide a full octave is a wonderful feature. However, most guitar strings would break if you attempted to bend the pitch an entire octave! Imitating a slide guitar may require playing around with the pitch bend settings to obtain realistic results. Trial and error is the name of the game with this process. You may be able to play some lines using these sound generators that would take twenty years to master on the real thing. On the other hand, the phrasing and transitions may be way off. Be patient with yourself as you adapt to the controller and the sound generator and do not be afraid to experiment. Get feedback from real players. Spend time listening to a variety of players – paying close attention to note transitions and phrasing. Try playing along with songs – preferably solo performances. For several of these instruments, I already have favorite players that I have listened to for many years (e.g., Miles Davis, Michael Brecker, and Jaco Pastorious). Having these masters as points of reference is very, very helpful. In other cases, I actually have played the instrument being imitated (e.g., trumpet, and Oud-like instrument). The modern sound generators are really quite good at getting the sound right. The trick in playing these sound generators is to provide everything else – phrasing, articulation, transitions, realistic harmonies, etc. The sound generators I explored have not quite caught up to LinnStrument’s capabilities. For example, none of the products discussed below permit each voice to receive on a separate MIDI channel, necessary for polyphonic pitch bends and polyphonic Y-axis control. However, that does not mean LinnStrument is not suited for playing these sounds. The combination of velocity and pressure sensitivity with the ability to bend pitch by sliding your finger provides all that is needed for realistic performances. Do not be shy about contacting plug-in developers to request new features and let them know about LinnStrument. Future articles in this series will feature various sound generators. For a preview, here is an improvised trio piece using the Sample Modeled Saxophone, bass, and drums all improvised on the LinnStrument. This entry was posted in Imitating real instruments, LinnStrument and tagged Getting Real, LinnStrument on June 19, 2015 by javafxpert.